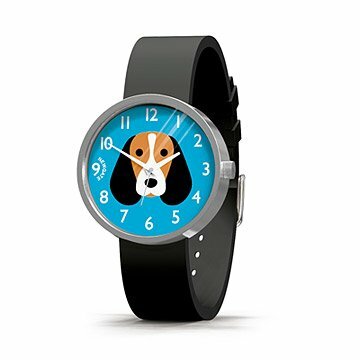 A fun, bright way for dog fanatics to keep an eye on the time. Every dog lover knows not a second, minute, or hour goes by you don't wish your pooch was by your side. Keep an adorable companion on your wrist all the time with one of these dog face watches. Crafted using a stainless steel finish and a soft black silicone strap, it's a durable, bright way to keep your furball affection on display. Made in China. Avoid exposure to extreme temperatures as this may adversely affect the time keeping and potentially damage sensitive components. I receive so many compliments on the adorable watch!!! This watch is just fun to wear for day to day use.